Flannel Friday: Hooray For Hat! Wow, it’s been a super long time since my last FF post. Happy to be back, even temporarily! While Laura made her animals reversible (genius!) to show their grumpy and happy faces, I did not. I just kept their faces neutral. I also added a tiny piece of velcro to the back of each of the hats to help them stick together as one so it would be easier for me to handle. And here’s Giraffe with all the hats. . HOORAY FOR FRIENDS! Finally, I made a felt “Hooray for Hat” sign that I could put up the first time we say it and then point to each time. This helps with print recognition and children beginning to think of themselves as readers. I cut the letters out with my library’s die cut so I think they look super cute. Today’s FF roundup will be hosted by Mollie Kay! Check out all this week’s awesome posts there! It’s been QUITE A WHILE since I posted a book review. Perhaps that’s because I’ve not felt inspired to do so in a while? Maybe, maybe not. 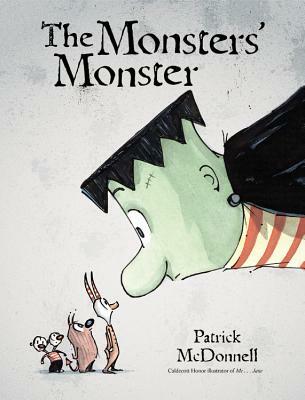 At any rate, I felt VERY inspired to write about Patrick McDonnell’s (he’s the creator of the Mutts comic and several other lovely picture books) new story, The Monsters’ Monster. Wait, what? Who is this BIG, BAD monster saying thank you? Monsters don’t say that! But Monster finally plows through a wall and heads toward the village to the bakery. Grump, Groan and Gloom ‘n Doom cheer and follow closely behind, hoping to hear the “howls and yowls” of the bakery’s inhabitants. But when Monster emerges, having NOT smashed up the bakery, with a small white paper bag, what will they do? This is JUST the right kind of not-so-scary story that’s right for young kids. It’s a bit long for toddlers, and introduces lots of great new words to add to a preschooler’s vocabulary. And the message of happiness at simply being alive? LOVELY. McDonnell’s illustrations are silly and filled with detail, but the muted shades of green, orange and grey are just right for the slightly-eerie tone. Add this to your Halloween or Monster storytime ASAP. You WON’T regret it – and neither will the kids who get to enjoy it!